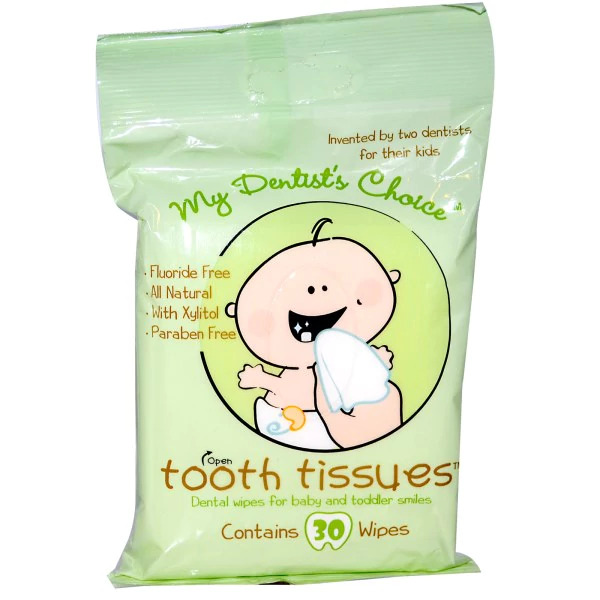 Easy to use tooth tissues and dental wipes to keep your baby’s teeth and gums clean. As practicing dentists we know that, starting from an early age, cleaning teeth and gums everyday to remove plaque is necessary to prevent decay. As parents, we know that it is not always so simple. That’s why we created Tooth Tissues: Easy to use, disposable, and effective wipes for cleaning your child’s teeth and gums. You will find that they are the best product on the market for your child’s oral health. They are uniquely textured for plaque removal, neutral-flavor, fluoride, paraben and sugar-free, and all natural. Tooth Tissues may be used from birth to promote healthy habits that will last a lifetime. You might even like to use them on your own teeth between brushings! P.S. Please remember to have your baby see a dentist by his or her first birthday. After every feeding, teeth and gums should be wiped, especially after night time feeding to protect against “nursing bottle” or “baby bottle” decay. Tooth Tissues are used from birth to promote healthy habits that will last a lifetime. Use wipe around all surfaces of teeth. Cleanse around gums, tongue and cheeks. For use from birth to 16 months. Do not flush. Keep out of the reach of small children. Choking hazard. Do not let children under 6 use unattended. Do not use if allergic or sensitive to any of the ingredients. Water, aloe barbadensis leaf juice, glycerin, hydrated silica, xylitol, sodium levulinate*, sodium phytate**, xanthan gum, potassium sorbate. *Sodium Levulinate: A corn derived preservative that is 100% natural and eco-friendly. **Sodium Phytate: A rice bran derivative that is a stabilizer. It is 100% natural and eco-friendly.